Hibiscadelphus hualalaiensis, of the mallow family (Malvaceae), is a tree 5 to 7 m (16 to 23 ft) tall with a trunk up to 30 cm (12 in) in diameter and whitish bark. The leaf blades are heart‐shaped and 10 to 15 cm (4 to 6 in) long with a broad tip, a notched base, stellate hairs, and stalks 4 to 10 cm (1.5 to 4 in) long. One or two flowers are borne in the axils of the leaves and have stalks 1.5 to 14 cm (0.6 to 5.5 in) long. Five toothlike bracts are borne below each flower and the calyx is tubular or pouch‐like. The overlapping petals form a curved bisymmetrical flower with longer upper petals, typical of bird‐pollinated flowers. The flowers are greenish yellow on the outside and yellowish green, fading to purplish within, and 2 to 5.5 cm (0.8 to 2.2 in) long. The fruit is woody and the seeds have a dense covering of hairs. The species differs from others in this endemic Hawaiian genus by its flower color, smaller flower size, and tooth‐like bracts. Hibiscadelphus hualalaiensis was historically known from three populations, located in the Pu‘u Wa‘awa‘a region of Hualalai, on the island of Hawai‘i. The last known wild tree was in Pu‘u Wa‘awa‘a Plant Sanctuary, owned and managed by the Department of Land and Natural Resources, State of Hawai‘i. These trees died in 1992, but 12 cultivated trees have been planted within the fenced area. In addition, approximately ten cultivated plants can be found near the State’s Kokia Sanctuary in Kaupulehu. 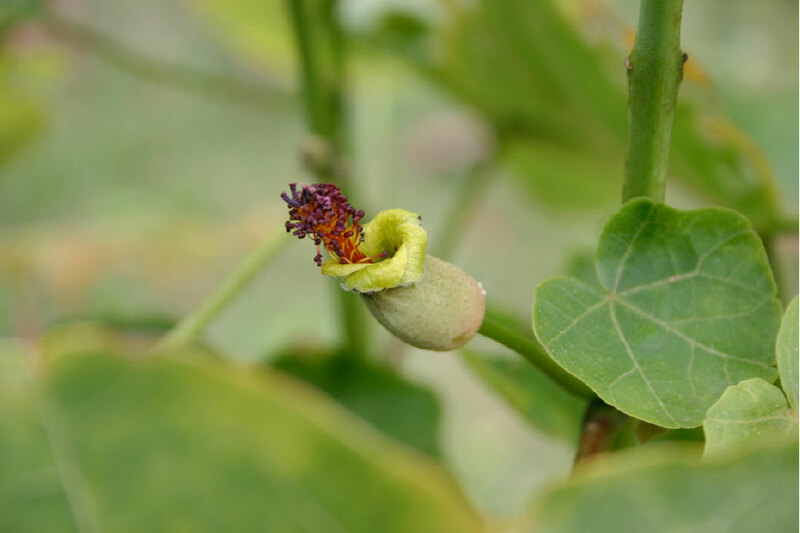 Cultivated individuals were planted in Kipuka Puaulu in Hawai‘i Volcanoes National Park, but were removed to prevent further hybridization with the Hibiscadelphus giffardianus plants that are native to the kipuka. The area where the plants are presently found is surrounded by State land that is leased for cattle ranching. There are no individuals extant in the wild, but 20 or more cultivated individuals are being grown at this time.